Hey all, sorry I’ve been an irresponsible blogger the past week. 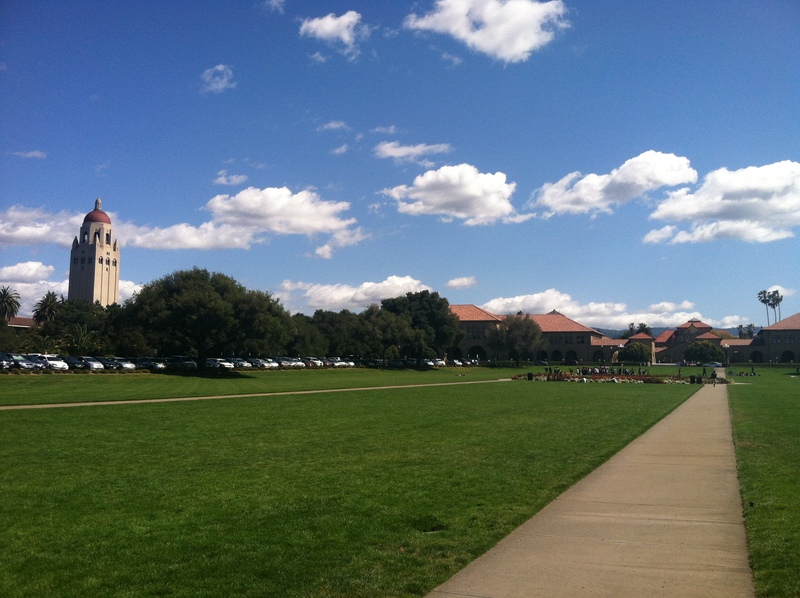 Plant posts are coming, but in the meantime, I just got back from a jaunt down to the Stanford oval, where the weather was surprisingly optimal for a little mid-day stargazing. Why yes, actually, I am going stargazing right now. You can see the little cluster of astronomers in the middle. 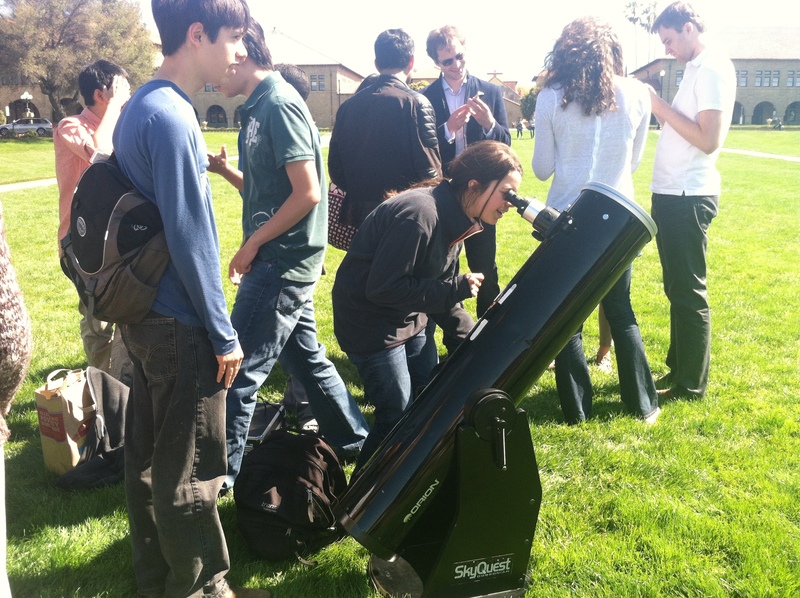 The Stanford Astronomical Society (SAS) was putting on a little show, with a couple of great telescopes entrained on Venus’ transit across the sun. I was somewhat surprised that the whole campus didn’t turn out to see this won’t-happen-again-till 2117 show, but it meant we all got enough time to take a good long look. How awesome is this? Pretty darn awesome. As several people commented, the very tiny arc size of Venus mostly serves to illustrate how frickin’ huge and very bright the sun is. I mean, on a moonless night, Venus is the brightest thing in the sky. 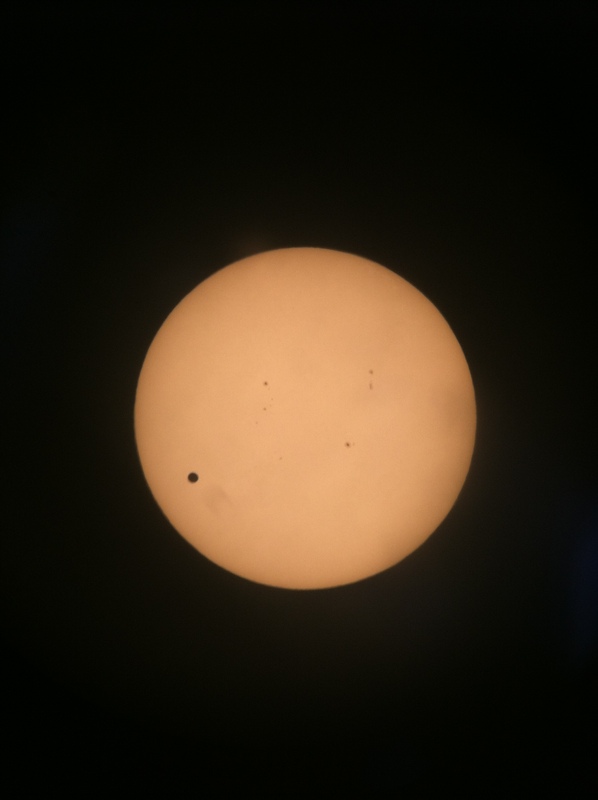 For looking at the sun, the scopes had filters on them that blocked 99.99% of the light, so that you could actually see the details of the transit. Plus look: you can see sunspots elsewhere on the sun’s face, too! (Photo by Michael of SAS). Here in CA the transit is still going until sunset, so if you have time, hustle on down to the oval or grab your eclipse specs, or try one of these projection strategies and check it out!